I’m always in awe of an author who writes a psychological thriller and manages to keep a single thread going throughout the book that keeps you turning the pages. That’s how it is with The Widow, the main theme being ‘who took Bella’, the toddler who went missing and ‘how much did the prime suspect’s widow know about it’? It’s a neat hook. Not 'how did the husband die? ', or the mystery of the missing child – but what happens when the ‘under-the-thumb’ widow suddenly gains a voice, now her husband (the main suspect) has gone. It’s the voice of the book that drew me in. The prose is very easy to read, kind of ‘naïve’ in style with the edge of quirkiness that has a slight flavour of Belinda Bauer about it. There are three main narrators, the detective leading the investigation for the missing child, the widow and the reporter who wants to scoop the story, hoping to woo the widow into spilling the beans to seal the guilt of her deceased husband so she can grab that smash headline. There are also chapters from the point of view of the accused husband and the mother of the missing child. This shifting of perspective keeps the story alive as we see what the main players know, what they’d like to know and what they are hiding. The widow, Jean, (with her alter-ego, Jeannie), is complex. She plays the role of the obedient and submissive wife in the flashbacks to when Glen (her husband) was alive, but there’s a calculating and passive-aggressive side to her. Hints near the start tell the reader that she’s secretly glad Glen is out of her life. ‘Me, the grieving widow. Don’t make me laugh.’ She’s got other secrets too, which gradually get revealed, although how her husband died is not really a major part of the intrigue. In the end, there is no real twist which was a tad disappointing, but the book is compelling, full of teases and taunts, as it pulls you from one possible outcome to another. The author shares the same literary agent as me and is certainly one to watch! Definitely recommended. Where did the inspiration for Inside the Whispers come from? The plot centres around a mysterious series of events, starting with a fire on the Tube and a handful of survivors who present for trauma therapy at a London hospital. My starting point was to draw on my own experiences working with traumatised and suicidal individuals to build a story involving my favourite subjects: secrets, deception and hidden motives! 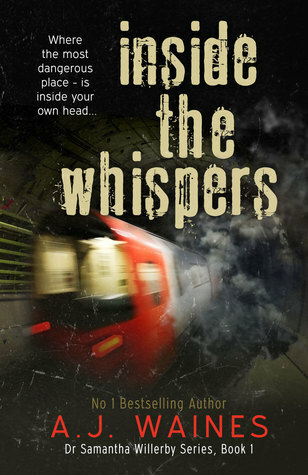 In fact, for most of the main characters in Inside the Whispers, things are not all they seem. Most of them are hiding or running away from something. A number of questions arise for Dr Samantha Willerby, the diligent and compassionate therapist, when she starts to see that her patients’ accounts of the fire are very similar, but don’t ring true. Are they faking it? Why are they lying? When one of them commits suicide, Sam feels personally responsible. She should have seen the warning signs, shouldn't she? But before long, it dawns on her that she’s caught up in a horrific web of manipulation and foul-play. A big twist at the end is pretty much de rigueur in psych thrillers, although my book is also a 'why' and 'how'-dun-it, as much as a 'who-dun-it'. There are twists and turns along the way, blindsiding the reader with revelations, shocks and red-herrings, as Sam gradually peels away the layers to get to the truth. I love to knock my readers sideways and there’s one final bombshell - right down to the last page! The story is based around patients with PTSD. How much of it is based on fact? When I worked as a psychotherapist, a number of clients came to see me with Post Traumatic Stress Disorder, and I wanted to give readers a ‘behind the scenes’ insight into that kind of work. Therapy is confidential and confessional with such a 'cloak-and-dagger' aura of secrecy - I think a lot of people are curious about what actually happens! One aspect that people are perhaps unaware of is ‘secondary trauma’ – when patients’ accounts are so distressing that it has a knock-on effect on the therapist, who can then internalise the details and, in turn, experience similar symptoms themselves, such as nightmares and anxiety. On one occasion, I worked with a city fire officer who suffered PTSD after his involvement in a fatal, horrific blaze and the images he described have always stayed with me. Some of these impressions have filtered through into the story (modified for fiction) which is one creative and therapeutic way of dealing with them. Thanks to Shelley-Anne for her great questions. If you have any questions about my books, just let me know in the comments below - I do try to respond to every reader who gets in touch! Inside the Whispers is available on all Amazon outlets worldwide now in paperback and ebook. I do hope you enjoy it! Launch date: 20 October 2016 on Amazon worldwide! I’m ashamed to admit I was running on autopilot for my first patients. I was keen not to miss Jake. At 11.40, I phoned the unit and found out he’d arrived and was still in the consultation room. Shortly afterwards, I sauntered past the waiting area and spotted him nodding to the receptionist, accepting a small card for his next check-up. He saw me and gave a weak smile. I asked if we could have a private word in my office. I offered him a seat in front of my desk and he sat on his hands looking like a schoolboy hauled up for smoking behind the bike sheds. ‘Okay…’ My mouth was dry. He responded immediately. ‘God, yeah. I told you, people’s coats were on fire. It was definitely in the hall, because I remember the barriers themselves were burning.’ He started to shake. He muttered something I couldn’t hear. ‘Let’s take a few minutes.’ I talked him through a simple grounding process to help him re-orientate himself: What day is it? What are you going to do next? Simple questions. He looked confused, but fully recovered by the time he left. As he shut the door, I plopped down into my chair. I knew now for certain. Jake sounded so genuine and yet his story didn’t make sense. He’d told me he’d climbed up from the Central Line to the ticket hall using the steps. But, there were no steps from the platforms to the ticket hall, coming in from either east or west. I’d checked the area twice and there was access by escalators and lifts, but no steps until you want to leave the ticket hall to reach the mainline concourse. Another part of his story didn’t add up either. He said people were on fire around him in the ticket hall, whereas the police were emphatic that the flames never got anywhere near there. I let the silence spill across the room and stared through the seat of the chair where Jake had been sitting. One thing was clear. For some reason, Jake was lying. What does 'Success' mean for a Writer? If you ask most aspiring authors what would bring them most joy, ‘Getting my novel published’, is probably the answer you’ll hear most often. To see your book in print - isn’t that what most writers dream of? But if you’re lucky enough to have had your novel published, what happens then? In my case, the term ‘getting published’ has been far from clear-cut. Having been advised at the start by my (then) agent to turn down an early offer from a UK publisher, my first books were published only abroad, in translation. It was an amazing start – I was *published* (that magic word), but none of my books were available in bookshops in my home country. Still, having got over those initial hurdles as a writer, I thought I would be home and dry. Surely, once you get as far as being published you’ve made it… Mmmm. Far from it. I started writing fiction eight years ago and in my limited experience, it seems that the life of a writer is riddled with constant ups and downs. There is no stable plateau of success. Take, for instance, securing an agent and landing my first book deal - I felt utterly fabulous during those times, but, as part of the package, crippling disappointments and rejections followed close behind. After a year with said agent and having written two more books, I was devastated to be unceremoniously dropped. No one had warned me that could happen! I thought I’d broken through into a ‘special club’, but suddenly I was kicked back out again! Following a brief period of doubt and uncertainty, I was picked up by another agent, because he thought someone with my psychotherapy background was worth a try. A stroke of luck there – I was the right person for him at the right time. It was another real high point. I think back now to my utter disbelief when I saw my name alongside HG Wells on the agency’s website! But another fall from grace was on its way. After getting book deals abroad in 2012, no publisher in the UK was forthcoming, so we published independently through a special programme on Amazon, called Whiteglove. But, things weren’t going so well and I split with that agent. Another difficult patch, but I wasn’t giving up. I found a new agent, published two more books independently and they started to take off. I’ve now had sales of over a quarter of a million books in thirteen countries, which far exceeded my wildest dreams. After my latest book, No Longer Safe, came out, for a few days my ranking as an author on Amazon US put me higher than John Grisham and Lee Child! That period was pretty special – even though it lasted less than a week! The flush of success is fleeting and seems to be made up of ‘moments’ such as these. ‘Working hard’ isn’t necessarily enough. Neither is being a ‘good writer’ – there are just SO many excellent writers out there. Sometimes it's down to luck – such as producing the ‘right’ novel at the ‘right’ time, or as in my case, a quirk of fate. My writing career took off when one of my books started getting mixed up with a bestseller that is now out on film (you can read about that here). What I notice now is how much the goalposts change and how the stakes keep on getting higher. In fact, I’m not sure there is ever a static point of success as an author. I know a lot of writers feel the same. While most have an initial goal in mind – to be published – if they are lucky enough and/or gifted enough to achieve this, new pressures, unforeseen ones (such as 'second novel syndrome'), quickly take its place. It’s all about the ‘next’ book. Will it sell? Will it be as good as the last one? I know of several well-established authors who have been dropped by their publishers, because they haven’t met their sales targets or a particular genre has become over-subscribed. Once upon a time, getting a publisher meant you’d made it! These days, it doesn’t necessarily mean you’re ‘in’ for life. Get your head down and keep going seems to be the best advice! When I think about success, I find myself coming back to these fundamental questions: How do you measure true success as a writer? Is it about book sales? Is it feeling touched and humbled when lovely readers bother to let you know they’ve enjoyed your books? Is it a high ranking on Amazon or in the Sunday Times charts?' Or is it about doing your best? Is it the knowledge that you’re following your passion with conviction and authenticity? In times of uncertainty and setbacks, these core values underpin my work and keep me going. When things are going well, they remind me to look deeper than any surface acclaim or passing triumph, because tomorrow and the day after, the glory of a number one slot, for instance, will belong to another writer! I’m in a strange paradox where I’m living the dream, but still chasing it! Once you get beyond a certain point, it feels like there’s a lot to lose. That’s why it’s important to take stock and remember why I joined this writing roller-coaster in the first place and why I put myself through all the heartache. How about you? Writer or not, what are the real drivers behind what you do?